While people talk of Brexit and Britain keeping out of the EU and the Euro, they might like to hear of a little known fact. France never really joined the Euro. 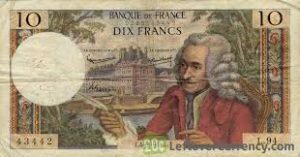 In the sense that the majority of French government debt is still nominated in old French Francs. They are also now looking at revaluing their remaining Euro debt back into Franc debt, and getting ready to devalue the old currency as the scale of their debts is off the scale. When QE (Quantitative Easing) ends or reduces later this year, as is expected, all the chickens will come home to roost. Deutsche Bank will be going down according to this commentary. 90% of French debt is held by German banks. Italy is also in debt to Germany, as are Greece, Portugal and Spain. However the biggest financial mess is France. The German real economy is doing well. France has signed multi-billion contracts with Russia. Germans are also contracting with Russia. They are ignoring the sanctions, and moving on, in defiance of Washington and Brussels. Deutsche Bank risk is linked to Wall St and London banks by virtue of massive derivatives exposure. This will pull London and Wall St into the coming contagion, which will inevitably trigger a currency reset. Russia is setting up a new oil cartel taking away control of the oil market from the Arab monarchies. Iran is working with Russia, China and India in Renmimbi, getting out of US Dollars, and building up their gold reserves. European nations are salvaging the nuclear deal. All are loading up on gold, including European nations. FFTT consulting group report that Central Banks can get out of the mess of impaired sovereign bonds. To do this they will have to load up on gold and raise the price tenfold – this was the formula stated in the 1980s. Return to the gold standard will come and rescue the banks’ insolvency. China will announce a gold backed note, maybe Turkey also. Gold will be the way the banks get out of the mess. The US doesn’t have enough gold to fix its debts, or other assets, even when it recovers the gold stolen from Fort Knox by Wall St, Clinton, Bush. (CIA). US needs a huge increase in gold reserves to stand a chance of draining the swamp, which has stolen all the gold.